Sliema is one of Malta’s most popular neighborhoods because of its wide choices of accommodation. 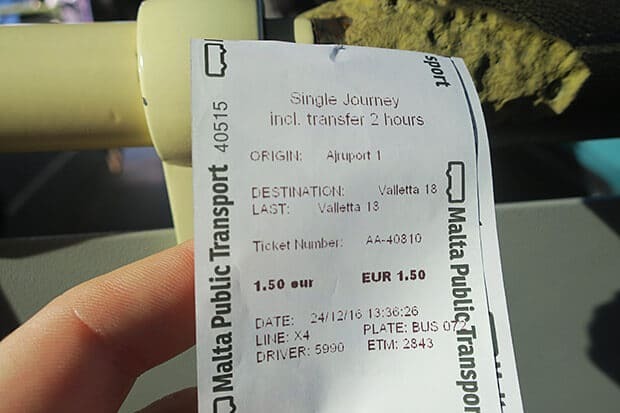 Fortunately, it is easy to get from Malta International Airport to Sliema using public transportation, particularly the public bus. 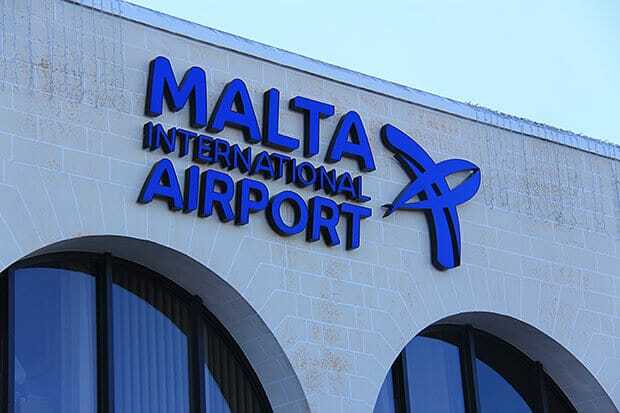 All international flights to Malta land on Malta International Airport. You can get to Malta from major European cities like London, Amsterdam and Brussels. Welcome to Malta! The small but mighty European nation! In our case, we flew from Athens to Malta using the budget airline RyanAir. Flight time is only two hours, which is super convenient and RyanAir flights are relatively cheap. On our first few nights in Malta, we decided to stay in Sliema for a couple of reasons. The first reason is Sliema offers a wider range of hotels and accommodation compared to other neighborhoods in Malta. It caters to travellers of different budget. We decided to stayed at the Sliema Hotel for the value and great location. Another reason to stay in Sliema is its accessibility to public transportation. 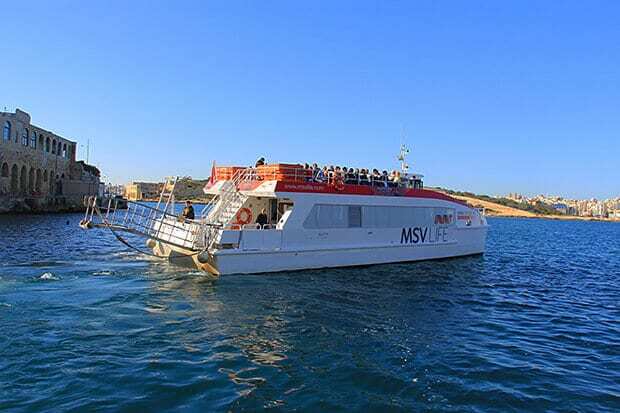 There is a port in Sliema that facilitates the public ferry to the capital Valletta. So if you are like us and would want to stay in Sliema, here is a step-by-step guide on how to get from Malta International Airport to Sliema using public transportation. 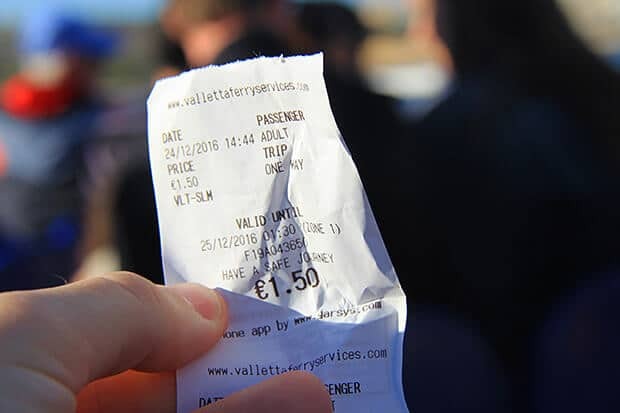 Although you can always rent a car from the Malta airport and drive around Malta, it is not really necessary as Malta cities are small and it has a good network of buses that cater to commuters and tourists. 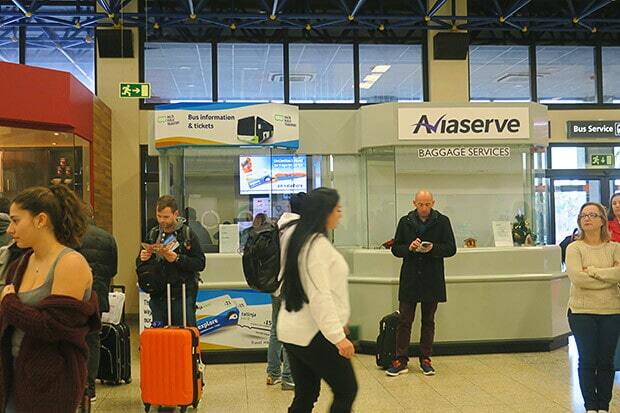 There are many car rental companies operating at the Malta International Airport. But if you insist in driving everywhere in Malta, then you have a good selection of car rental companies at the Malta International Airport. We do recommend that you book your car rental online way ahead of your arrival date. So when you arrive at the airport, all you need to do is pick up your car. You can easily take a taxi from Malta International Airport to Sliema. Taking a taxi is a good idea if you have a lot of luggage and if you would want to get drop off at your hotel’s doorsteps. 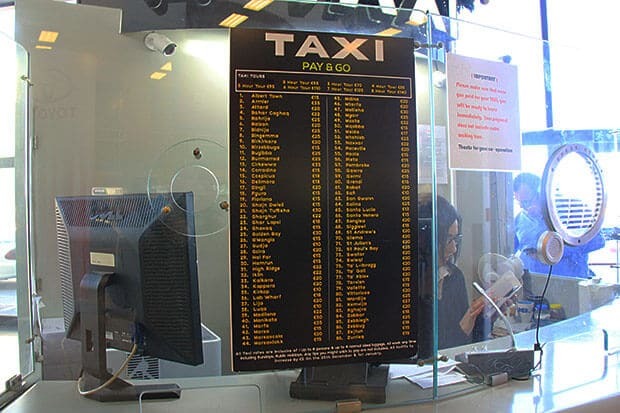 Taxi Fare Rate. That is if you don’t want to take the bus. Taking the public bus is a good option if you have time, can carry your luggage, and would want to save some money. You can also sight-see while on the bus. Step 1. 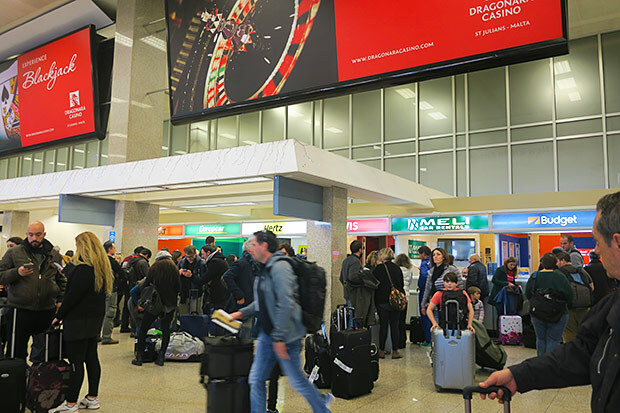 Clear Immigration and Customs and make your way to the Arrival Hall of the Malta International Airport. Step 2. Look for the Information and Sales Office of the Malta Public Transport. You can buy the bus ticket or multi-day pass from here. If you only want a single journey ticket, you can buy this on the bus. Step 3. Walk to the public bus bay across the road from the Departures Hall. There are FOUR express bus service routes available from the Malta International Airport. They are are X1, X2, X3, and X4. Each bus route has a dedicated bay. The hallway you need to walk through to get to the Malta Express Bus bays. Step 4. 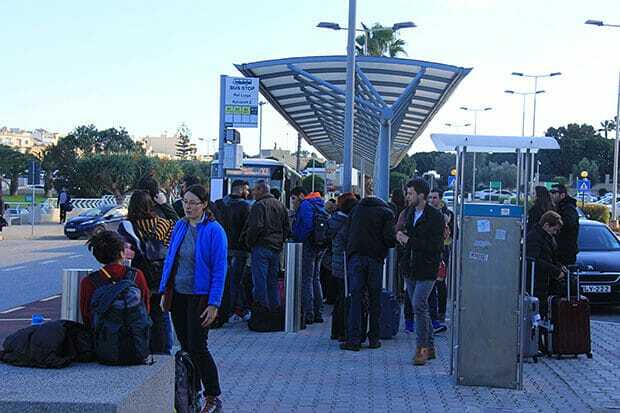 Go to X2 Bay and wait for the X2 bus, since you are going to Sliema. Make sure you have small change as it is considered a nuisance for drivers to get big notes for a one-way ticket. Step 6. Arrive in Sliema and enjoy your stay in Malta. Step 1. 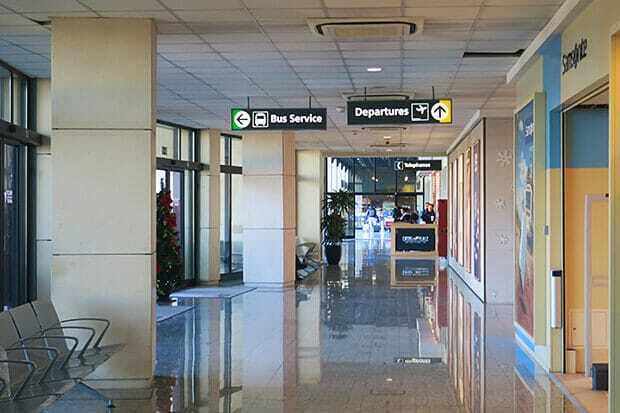 Go to the public bus bay, which is just across the road from the Departures Hall of the Malta International Airport. Step 2. Take the X4 Bus, which goes to Valletta. Take note that each Airport Express Bus Service has its own bay. Step 3. Get off at Valletta Main Bus Stop. This bus terminal is the first stop of the X4 Express Bus, so it is going to be a short ride. Step 4. From the Valletta Bus Stop, you need to walk to Marsamxett Harbour. The walk from Valletta Bus Stop to Marsamxett Harbour is around 12 minutes with a distance of around 850 meters. 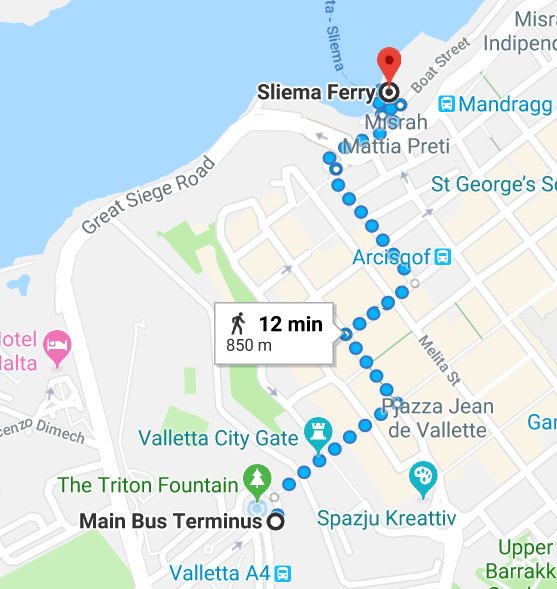 The walking route from Valletta Main Bus Terminal to Marsamxett Harbor where the Sliema Ferry Kiosk is located in Valletta. 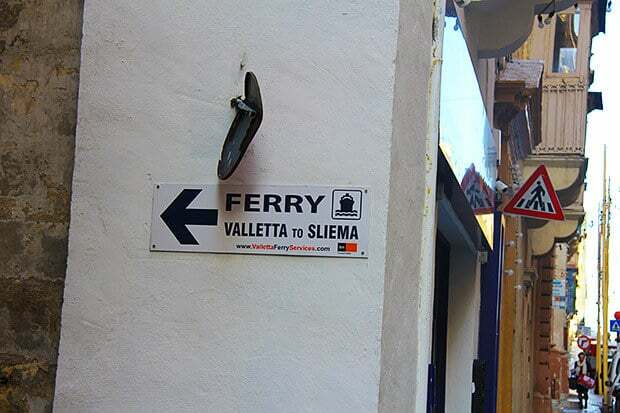 Walking towards the harbour, you will see signs that will guide you where to take the ferry to Sliema. Step 5. Arrive at Marsamxett Harbour and proceed to Boat Street. Here you will find a dedicated kiosk and dock for the public ferry going to and from Valletta and Sliema. You need to line up to board the public ferry to Sliema. 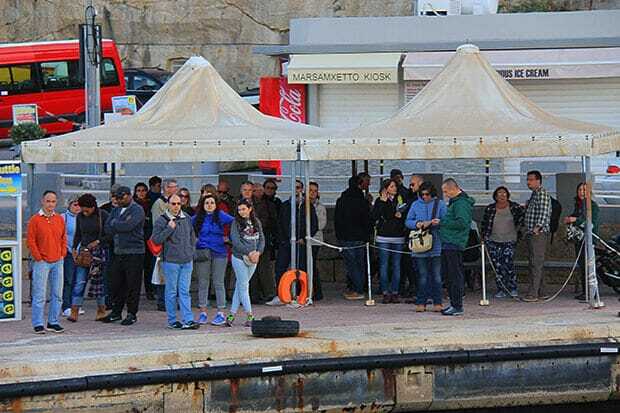 Passengers waiting to get on the ferry to Sliema. Step 6. Pay the one-way ticket when you board the ferry. There’s a staff that sells the tickets. Step 7. Arrive in Sliema Ferry Terminal on Triq Ix – Xatt. Enjoy! The bus service on Malta is operated by Malta Public Transport. This service runs from 5:30 am to 11 pm. Take note of these times as this will determine whether you need to take a taxi from the airport if you are arriving late at night. There is a bus night service but it only runs from Friday to Saturday nights and on public holidays. As mentioned earlier, you can buy a one-way ticket from the driver on the bus. Please have small change ready as bus drivers don’t usually like giving change to big notes. You can also buy multi-day bus cards from sales offices or booths run by the Malta Public Transport. Some retail shops (7-eleven style) also offer these cards. So there you go, the step-by-step guide on how to get from Malta International Airport to Sliema Using Public Transportation. If this guide is helpful, please like it so that other travelers can benefit from this travel information.